Getting a call that a loved one has been diagnosed with dementia can be difficult and confusing. What does it mean? How will this affect their life? How can I help them? A great way to start is by understanding the diagnosis itself. For starters, did you know dementia isn’t a disease? Dementia is a syndrome, unlike Alzheimer’s which is classified as a disease. A syndrome is when a group of symptoms doesn’t lead to a specific diagnosis. It’s the umbrella term used to describe symptoms that impact memory. There are also reversible dementia, where negative drug interaction or vitamin deficiency cause the symptoms but can be reversed with the right treatment. A great example of this is dehydration. Dehydration symptoms in seniors can mimic the symptoms of dementia, like confusion. Not only is this easy to reverse with proper hydration, it’s easy to prevent. Then there are the non-reversible dementia. These are the ones that have the greatest impact. It’s important to know the difference between them, and how they affect each person. Because these dementia all have their own set of symptoms, staying educated about the different types of dementia can help us recognize and treat the symptoms before they get worse. Currently, Alzheimer’s disease is degenerative and incurable. However, there are new scientific discoveries made frequently about the disease and medical interventions it responds to. The average life expectancy following an Alzheimer’s diagnosis is eight to 10 years. However, everyone diagnosis is unique. 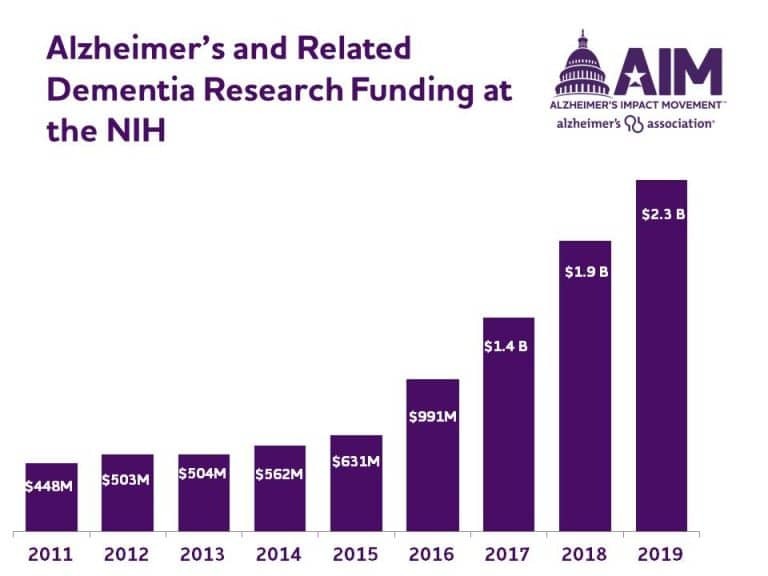 With recent additions to the National Institutes of Health’s budget for 2019, we can hold out hope that more positive discoveries will be made. The second most common dementia is vascular dementia. Symptoms occur from blood vessel blockage or damage, leading to strokes or bleeding in the brain. These symptoms can occur suddenly and include impaired judgment, difficulty concentrating, and problems with planning, organizing or making decisions. Lewy body Dementia is a progressive brain disorder in which abnormal deposits of a protein called alpha-synuclein build up in areas of the brain that regulate behavior, cognition, and movement. These deposits interrupt chemical messages in the brain and cause memory loss and disorientation. LBD also affects body functions such as blood pressure control, temperature regulation, and bladder and bowel functions. As it progresses, people diagnosed with LBD can experience visual hallucinations or act out their dreams. 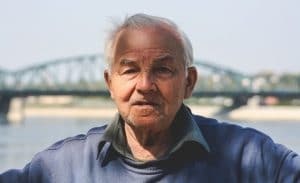 Mixed dementia combines two or more disorders, one being dementia, with the most common combination being Alzheimer’s and vascular dementia. The Jersey Alzheimer’s Association reported that up to 45 percent of people with dementia have signs of both Alzheimer’s disease and vascular dementia. Frontotemporal dementia was once known as Pick’s disease, several disorders that affect the frontal and temporal lobes of the brain. The symptoms of frontotemporal dementia depend on the areas of the brain affected: behavioral or language. Behavioral symptoms like inappropriate actions, lack of inhibition, neglect of personal hygiene and compulsive behavior are most common. Language related symptoms include difficulty speaking or understanding, language recall problems, and difficulty with social interactions. Most commonly caused by alcohol abuse, Wernicke-Korsakoff syndrome is a chronic memory disorder caused by severe deficiency of thiamine (vitamin B-1). This deficiency causes bleeding in the lower section of the brain, affecting muscle control, the ability to remember things, and trouble learning and processing information. Wernicke-Korsakoff syndrome’s not technically a type of dementia but has been categorized with other dementia because of shared symptoms. While Parkinson’s disease isn’t a form of dementia, nearly 1 in 5 people diagnosed with Parkinson’s will develop dementia. Look for early warning signs like difficulty understanding visual information or remembering how to do simple daily tasks. As the disease advances, an individual with Parkinson’s could become more depressed, paranoid, or have trouble speaking or recalling words during conversation. Like people living with Parkinson’s disease, individuals with Huntington’s disease often develop dementia. A defective gene causes brain cells to break down prematurely, which causes dementia symptoms including difficulty thinking, focusing and reasoning, or learning new things. Movement can also become impaired, making essential activities like walking, talking and swallowing challenging. One of the rarest forms of dementia, Creutzefeldt-Jakob Disease, occurs in only one in 1 million people each year. The brain is infected by an abnormally shaped protein called a prion. While the symptoms mimic those of other types of dementia (confusion, memory loss, agitation, depression) those diagnosed with the disease also experience muscle stiffness and twitching. Creutzfeldt-Jakob disease progresses rapidly. Aegis Living’s nationally recognized memory care program Life’s NeighborhoodTM, improves the quality of life and increases enjoyment for people living with memory loss. If you are interested in learning more about this program, contact your nearest Aegis Livingcommunity.